Is there a new (media-)historical type of learning emerging? In my recent live presentation/session for PLENK2010 I was trying to argue that if we want to get any further with the notion of Personal Learning Environments (PLE), we need to stop staring exclusively at the current (and transient) level of technological (Web) development. Instead, we need to analyse the “personal learning” side more seriously. One possible perspective to take here is a (socio-)historical one. What types of learning have emerged over time and coupled to what (media-)historical developments? Personally, I find it rather useless to talk about environments for personal learning (or Personal Learning Environments) without an exploration of the types of learning (or the types of learning activity) these, so called, environments are supposed to constitute, support, or facilitate (you name it). “Learning” is coupled to the body and (mostly local) social practice. Think: observation, co-ordinated action, apprenticeship, and so forth. Book- & text-culture allow for the emergence of a new media-historical from of “knowledge”. The book (text) becomes the new leading medium. In this context “learning” emerges as “activity” (Lerntätigkeit). De-contextualised, systematic taucht-learning becomes the dominant format and gets institutionalised in “school”. Contextualised, experience-based learning is gradually de-valued in society and taught-learning is treated as “learning” par excellence. what gets on centre-stage is the learning of sense-constituting. Erdmann & Rückriem acknowledge that the former (media-)historical types of learning were also “sense-based”, of course. However, sense was either coupled with the actual contextualised personal (and social) experience, or the de-contextualised (book-)knowledge. What the authors see emerging is the de-coupling of knowledge (generating?) system(s) and meaning (generating/constituting?) systems(s) in the information society. Learning how to constitute sense becomes thus an important individual and societal task. This new type of learning can be (should be?) characterised as net-worked (I spare me a more detailed description of the “networkedness” as it is understood by Erdmann & Rückriem). Erdmann & Rückriem prosose that these historical types of learning have emerged and developed in a successive, irreversible manner. However, they co-exist largely unconnected (which is really to be expected in the early stage of the ongoing cultural transformation). …if we want to theorise about “learning” what boundaries do we want to draw? … and why? …do we want to model individuals, groups, networks, organisations, etc. as the agents (of learning)? …if we choose to model “personal learning” … what types of learning (Lernform) do we want to (or should we) focus on in the light of the ongoing (digital) transformation? …if there is really a new (media-historical) type of learning emerging, how would a “personal learning environment” for such type of learning have to look like? Erdmann, J. W., & Rückriem, G. (2010). Lernkultur oder Lernkulturen – was ist neu an der ,Kultur des Lernens’? In G. Rückriem & H. Giest (Eds. ), Tätitgkeitsteorie und (Wissens-)Gesellschaft (pp. 15-52). Berlin: Lehmans Media. I am finally out of project work and will dedicate the next 12 months to reading, thinking, and writing. Enough of EU funded R&D for a while! It was really about time to re-focus on my personal educational and academic interests. Naturally the move forces me to go through yet another “transition” phase, requiring considerable adjustments of all kinds. Tiring.. and refreshing at the same time. This is probably old news for the professional usability crowd. However, I have recently re-visited a number of ISO standards that I made use of within my earlier consulting work on human-centered design, Web (and Software) usability. It appears that ISO 9241 that used to be titled “Ergonomic requirements for office work with visual display terminals” is being re-titled and re-organised. The first part of ISO 9241 that has been renumbered seems to be the old part 10 that is now Part 110 “Dialogue principles”. However, the dialogue principles still seem to be the same. What I also find noteworthy is the fact that good old ISO 13407 “Human-centred design processes for interactive systems” will be integrated into ISO 9421. The new draft version is titled “Human-centred design for interactive systems” and should become part 210 in the new numbering system of ISO 9241. I am not sure yet what is actually being changed (apart from the number…). If you know more about it… shoot me a message. Yesterday George Siemens, Stephen Downes, Rita Kop and Dave Cormier kicked off their open course on Personal Learning Environments, Networks and Knowledge – PLENK2010. The current list of registered (potential) participants is a bit over 1100 (and probably rising) which certainly justifies the application of the label of MOOC (Massive Open Online Course). George Siemens recently published his reflections on open courses of this kind. PLENK2010 seems to be a timely extension of our recent collaboration on the upcoming e-book – G. Siemens, S. Downes & F. Kop (Eds. ), Personal learning environments and personal learning networks (working title): Athabasca University Press – and a follow up of some of the issues raised around the PLE conference 2010 in Barcelona a couple of weeks ago. Though I have never tried to run courses on the scale of a MOOC there are some striking parallels between what George & Co. are promoting in respect to free-choice of loosely-coupled tools as an important part of (re-)mediation of (learning) activity, and my own educational intervention work of recent years. Since I am slowly working my way back into facilitating “courses” (if that is the right term…) in higher education, I am curious to see what works (and what doesn’t) in the context of #PLENK2010. If nothing else… it is going to be interesting if my (more theoretical) reflections on the concept of personal learning environments will resonate at all with course participants. It looks like we will find out sometimes in late November when I am (tentatively) scheduled for a live session in the week focusing on “Critical perspectives on PLE/PLN” (so far only a place holder). Finally, we received the review comments for our text on “Modeling the personal adult learner: the concept of PLE re-interpreted”. The final version of this text will go into G. Siemens, S. Downes & F. Kop (Eds. ), Personal learning environments and personal learning networks (working title): Athabasca University Press. As usual, some of the review comments are helpful while others make little sense at all. What particularly amused me was the following: we make an explicit statement that we see our overall contribution as a reply to Johnson & Liber (2008) and that we want to extend the discussion of what these authors put forward. Johnson, M., & Liber, O. (2008). The personal learning environment and the human condition: from theory to teaching practice. Interactive Learning Environments, 16(1), 3-15. Alright… I am just getting ready for the next leg of this trip. Spent some fabulous time in Sydney, ACT and in the South-East of NSW. 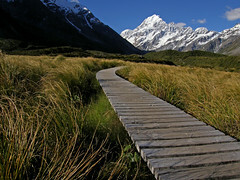 Now, off to Christchurch, NZ, for some critter-free holidays on beautiful South Island. A happy, healthy and peaceful 2010 to you all! … resistance and subversion are not accidental disturbances that need to be eliminated. They are essential core ingredients of interventions, and they need to have a prominent place in a viable intervention methodology. This is a view I share completely. In fact, any intervention that does not produce a level of resistance among key actors probably doesn’t even attempt to go beyond the existing mode of operation… and thus remains within the horizon of first-order change at its best. Reference: Engeström, Y. (2009). The future of activity theory: A rough draft. In A. Sannino, H. Daniels & K. D. Gutierrez (Eds. ), Learning and expanding with activity theory (pp. 303-328). Cambridge: Cambridge University Press. On Monday, December 7. we carried out our Cascading Change symposium at the 26th ASCILITE conference in Auckland, New Zealand. For various reasons the original group of nine contributors was cut down to four who actually made it to Auckland. While I certainly would have liked to meet all the folks who had committed to the proposal, I think we would have been (even more) in trouble with the time-slot of 60 min that we had been allocated. Even if you get nine contributors to limit their air-time to 5 min statements (which already is a hard job) you end up covering 45 min. An open, conversational format is simply not possible in such a time frame. So, even with the four remaining contributors we covered about 30 to 35 min with a few words of general welcome and introduction and a series of short impulse presentations of about 5 min each, before we could even open up to the larger plenum. We had agreed upon this format in a lively, preparatory conversation on Sunday afternoon before the actual conference kicked off. In fact, I think we should have brought that conversation on stage… but more to that later. Altogether, our slightly eclectic individual statements/presentations apparently worked as a conversation opener. There was clearly interest in the over-arching theme and present ASCILITErs were eager to chime in an voice their opinions. However, when things just started to get somewhat interesting we already had to wrap up the session and disperse the convention. I found this extremely unfortunate. So, in retrospect I should have never accepted the reduction of the original 90 min time-slot by the planners of the overall conference programme. On the contrary, I think I should have demanded two hours as a minimum to tackle a demanding topic in a conversational format with a (potentially) large group of people. For me this is not a mere matter of delivering a good performance for an audience. I actually want to hear other voices and opinions on a particular theme and not only broadcast what I have already thought through and then finish that off with a little harmless question and answer ping-pong. The latter seems to be considered the height of audience participation in academic conferences these days. This brings me to the physical space. The theme of ASCILITE09 apparently was “Same places, different spaces”. Unfortunately, our symposium was placed in an enormous, theatre-style lecture hall that can certainly be qualified as yet another example of the “same spaces” (as usual) that one generally encounters in educational conferences. No matter what you do in such a space… it does not create an egalitarian, conversational flow. There are some actors on stage… and there are spectators. Our attempt to compensate a little by dragging in some chairs from the coffee break area didn’t show much effect, I suppose. It only ensured that the contributors moved at least away from the central podium. An appropriate “space” is just another aspect that I simply should not (and hopefully won’t) compromise about. A symposium simply requires “different spaces” than a good old lecture hall… no matter how fancy and well equipped it is. I had a few conversations with George Siemens and Rob Fitzgerald during the remaining conference days on the symposium, the presentation formats encountered, and the general failure to create real, genuine dialogue within the actual conference programmes… and not only during the breaks and social get-togethers. In the case of a symposium I am willing to do away with any kind of impulse presentations. I can easily imagine to simply start with a conversation among a group of informed peers on stage… that gradually draws in more and more participants. It would provide a hyperlink-cloud around the individual contributors to get an idea of where they are coming from, and possible end with recommendations on further readings… plus some form of mediated conversation and exchange beyond the event. No presentations, no lecture halls, no 60 min time-slots. Stay tuned… I will try this somewhere sometimes in 2010. I am in the middle of my preparations for another longish trip to New Zealand and Australia. Tonight’s heavy rain here in Nürnberg makes the prospect of diving into spring and early summer in the Southern Hemisphere even more attractive. And… I do need a break and re-charge my batteries again. I can feel that. This time I am renting out both my apartments in Nürnberg and Vienna. Quite a hassle … but also an interesting exercise. It kind of forces me to sort through my stuff and see how quickly and painlessly I can tuck away my belongings and leave my home-bases to someone else. Economically this all makes perfect sense, of course. Rents are currently my biggest cost item… so, finding someone else to move in while I am gone allows me to set up a pretty decent travel budget. The overall trip will be kicked off by attending ASCILITE 2009 in Auckland. Followed by a two-week car trip exploring the Northland region. Around Christmas a hop over to Sydney will bring about a reunion with Anne and Stephen Bartlett-Bragg (its about time guys! )… and hopefully some fireworks in Sydney harbour. Then, some trip in South-Eastern Australia, before flying from Sydney to Christchurch to start off on another car/camping trip in the upper parts of South Island. Possibly some hiking in the Abel Tasman national park. Finally, a flight to Auckland… and then from there back into the Bavarian winter.